Wall Street 4-pc. Queen Leather Platform Bedroom Set w/ Storage Bed This Wall Street 4-piece queen leather platform bedroom set with storage bed exudes style, sophistication and posh city living. Perfect for contemporary decorators, the set's streamlined frames and upholstered headboard will help give your bedroom a chic look. Plus, with its delicious dark chocolate finish, it can complement virtually any color scheme! And for a convenient finishing touch, lighting in the nightstand helps guide your way in the dark, while 2 lights in the headboard are great for reading before bed. This Wall Street 4-piece queen leather platform bedroom set with storage bed exudes style, sophistication and posh city living. Perfect for contemporary decorators, the set's streamlined frames and upholstered headboard will help give your bedroom a chic look. Plus, with its delicious dark chocolate finish, it can complement virtually any color scheme! And for a convenient finishing touch, lighting in the nightstand helps guide your way in the dark, while 2 lights in the headboard are great for reading before bed. Overall Bedroom Set Weight: 886 lbs. L: 94" x W: 64" x H: 53"
L: 66" x W: 19" x H: 33"
L: 40" x W: 2" x H: 40"
Elegant bed, good quality. head board comes with a small storage place with two lights. I brought the complete 4 pieces set. lt made a rich look in my bedroom. This set really is worth the money! We purchased the 4 piece set, plus the chest. The quality of the product is definitely worth every penny spent, not to mention the sleek look it brings into our bedroom! The light built into the bed above our heads adds such a nice touch as well. Definitely definitely definitely recommended!! The furniture looks wonderful in my bedroom. Has great features. Especially love the shelf with lights on the headboard. What I like about this product is the overall build quality. This product is durable and provides the user a superb experience. Very impressed with this bed. Great look, strong build, awesome finish and the LED light really sets off the bookcase! Just a beautiful set sold by the perfect salesman Ahmed! I love everything about it! Amazing quality overall. I love my new bedroom set. Just what I wanted. A really beautiful set. Hope my son likes it when he comes home to visit!! 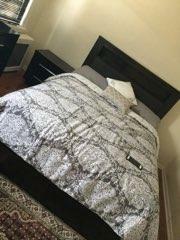 sleek in design, color looks elegant and the queen size is perfect in my room. Whaat are the dimesions of the foot board drawers ? It says that the light bulbs are not included. where can I purchase them then? BEST ANSWER: Any Home Improvement or Department store should have the bulbs available. will you provide assembly at the time of delivery? 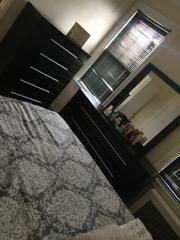 is dresser, night stand and mirror included? BEST ANSWER: Yes, the 4-pc set includes the bed, dresser, mirror and one nightstand. How do you remove a drawer from the tall dresser? BEST ANSWER: There are levers on either side of the drawer. The left one needs to be pulled up and the right pushed down. You can then slide out the drawer. Hi. Would I beable to buy this set without the woman's piece ? BEST ANSWER: If you are referring to the dresser, yes you can purchase the set without it. We do have a chest available as an alternative. For assistance, please contact us at 866-383-4484 option 3. The leather on head board is it 100%? Also will it keep it color and presence afer a few years or will it dry out and start cracking? BEST ANSWER: The headboard is bonded leather which is leather shavings and a binder together to create the look and feel of genuine leather. Bonded leather behaves more like a fabric than leather, and with proper care, will last for many years. Bed frame come without drawers? BEST ANSWER: The bed frame includes 2 drawers at the foot of the bed. Yes they do. There’s two drawers in the front. It comes with the drawers. Can you fit a king size mattress on this bed frame? BEST ANSWER: Hello, Tricia! Thank you for your inquiry regarding the Casana queen bed. This specific piece was not made to comfortably fit a queen-sized mattress only. We would not recommend a king mattress for this set. We certainly hope this helps! No, bécause if the base is queen and if the matress is king it won’t fit in the frame of the bed. I have the set and it comfortably fits a Queen sized bed so a King may be too big for the frame. Hello. Can I connect any device through the headboard? BEST ANSWER: This particular bed does not have the Bluetooth device feature. Can I use wood furniture polish on the wood? Murphy oil? Scott's liquid gold? Guardsman? Is this available in a lighter color wood? BEST ANSWER: The Wall Street collection is available in the brown finish shown only. Does this bedroom set come in King size? BEST ANSWER: Yes. The Wall Street 4-pc. King Leather Platform Bedroom Set w/ Storage Bed is SKU # 596329245. If i wanted the decor shown in the picture would i be able to purchase it from your company? BEST ANSWER: Some of the items are sold by Raymour and Flanigan under the Decor category. We would be happy to assist you in locating any of the accessories, as even if we do not sell them, we should be able to assist you with where it was purchased. For assistance, please contact Online Sales at 866-383-4484, option 3.
can i use my box spring and matress? BEST ANSWER: Yes. Although the Wall Street Bed is a Platform bed and does not require a box spring, it will accommodate your existing queen size mattress, and a box spring if you choose to use one. does this bed come in full size ? BEST ANSWER: The Wall Street collection offers queen and king size beds only. What cleaning product can be used on the wood part ? I have a adjustable frame with mattress will the bed frame accommodate what I have? BEST ANSWER: The Wall Street Storage bed will not work with an adjustable frame because the drawer at the foot of the bed will interfere. BEST ANSWER: You can select any of our mattresses for use with this bed. A box spring is not needed. BEST ANSWER: The Wall Street collection is manufactured in Vietnam. Can you order the bed and dresser without the nightstand? BEST ANSWER: Yes, you can order the bed and dresser individually. What is the name of the area rug in the picture and what size is it. I couldn't find it under the rug section? BEST ANSWER: We no longer carry the rug displayed in the photo. It has been discontinued by the manufacturer. Can you order this in king size bed? can the mirror be hung on the wall or only on the dresser? BEST ANSWER: The mirror does not come with hardware to be hung on the wall, only attached to the dresser.